If you want to restrict access to directories on your website, you can use your hosting account’s built-in password protection feature. Note: This feature does not offer a typical member login experience like a bank or retail site. Features like that require databases and are much more complex. In Plesk, in the area for the domain name’s website you want to use, click Show More. Enter the Directory name (starting at the root of your domain name) and the Title of the protected area, and then click OK.
After protecting the directory, you need to add users that can log in to it. In the Total Protected directories area, click the name of the directory you want to use. Now, when browsing to that directory, only visitors that can enter a username and password combination can view its content. You can reset or change the credentials you use to log in to your hosting account via FTP, which lets you upload files to your account using an FTP client. Note: If you don’t see the icon, click Show More in the section for the domain name you want to use, and then click FTP Access. In the Name column, click the FTP user you want to modify. Enter the new login information you want to use, and then click OK.
What does it mean to get hacked? “Hacked” is a term you hear thrown around a lot — especially regarding websites — without much definition. Someone gained access to your account (typically via File Transfer Protocol, a.k.a. FTP). By gaining FTP access, hackers can insert their own code on your site. After gaining access to your site, they put malicious code in it. What the code does depends on the hacker’s objectives. Because hacking can be extra insidious, sometimes your site can get hacked without you ever realizing it. Other times, hackers will be incredibly ham-fisted and either bring down your site or replace it with an obscene message. Use a secure password. This means something better than just tacking a numeral 1 to the end of your first dog’s name. We have information in Keeping Your Hosting/FTP Password Secure. Have your site scanned regularly. A lot of companies offer tools that will go through your site looking for malicious/suspicious-looking code or activity. By being aware of the threat of hackers and taking a few precautions, you can stop your site from harming visitors and other sites around the Internet. The server’s certificate is unknown. 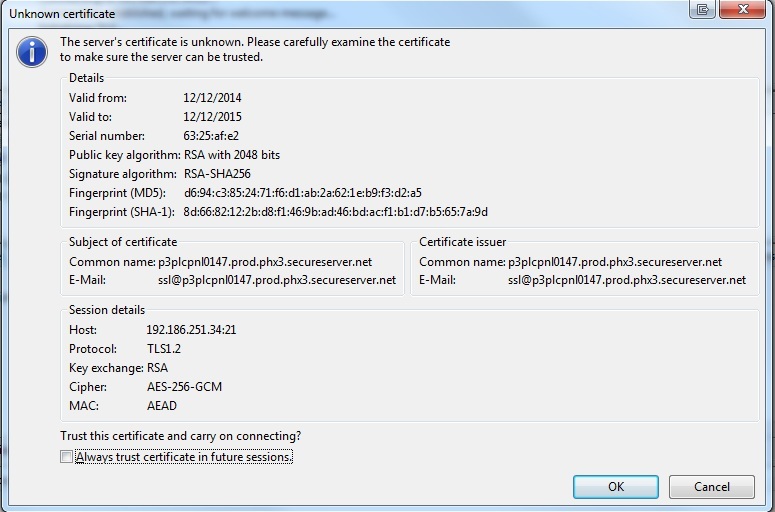 Please carefully examine the certificate to make sure the server can be trusted. To resolve this error, you must either connect via sFTP or disable TLS in FileZilla’s Site Manager. If you have problems establishing an FTP connection to your hosting account using FileZilla, check out the information below to help you resolve your problem. To correct this issue, you need to reset your password (Web & Classic / cPanel / Plesk). If you do not enter the correct user name, FileZilla does not produce a unique error. However, if you are not sure of your hosting account’s user name, you can find it in your control panel (Web & Classic / cPanel / Plesk). Your domain name must point to your hosting account. This happens by pointing your domain name’s DNS A record to your hosting account’s IP address. If you don’t know precisely what that means, don’t worry. You can use this information to check the issue. Find and note your hosting account’s IP address (Web & Classic / cPanel / Plesk). Check your domain name’s A record, and change it if necessary. For more information, see Manage DNS zone files. You are looking for the A (Host) record with @ in its Host column. It should match your hosting account’s IP address. There might be other issues affecting your ability to connect to your hosting account using FileZilla that you can solve by using a different value as your Host in FileZilla. Your hosting account’s IP address. For more information, see What is my website’s IP address?. Your primary domain name‘s root directory is httpdocs/. Secondary and subdomain names’ root directories were specified when they were set up. You can find them listed in Plesk. Navigate to the directory you want to use. Note: Plesk uses httpdocs as the root directory of your primary domain name’s website. Navigate to the file on your local machine, and then click Open. Warning:Manually backing up your website in Plesk temporarily brings it down. Visitors to your site will see a 503 Service Temporarily Unavailable page. From the home page of Plesk, click Backup Manager. Complete the on-screen fields. Pay close attention to the Backup content area — to back up your website, you need to select Domain configuration and content. You should also back up databases on your account. If you want to move WordPress hosting to a different directory – maybe you installed it in the wrong one. Whether you are moving WordPress to a new server or to a different location on your server, you don’t need to reinstall. WordPress is flexible enough to handle all of these situations. WordPress has instructions in their Codex.